May is a time for celebrations and honoring accomplishments. The month kicks off with Mother’s Day and ends with graduations and end-of-school parties. At Justice in Aging, May celebrations also include Older Americans Month and the 50th anniversary of the Older Americans Act (OAA). We must urge Congress to reauthorize the OAA as we celebrate its impact. 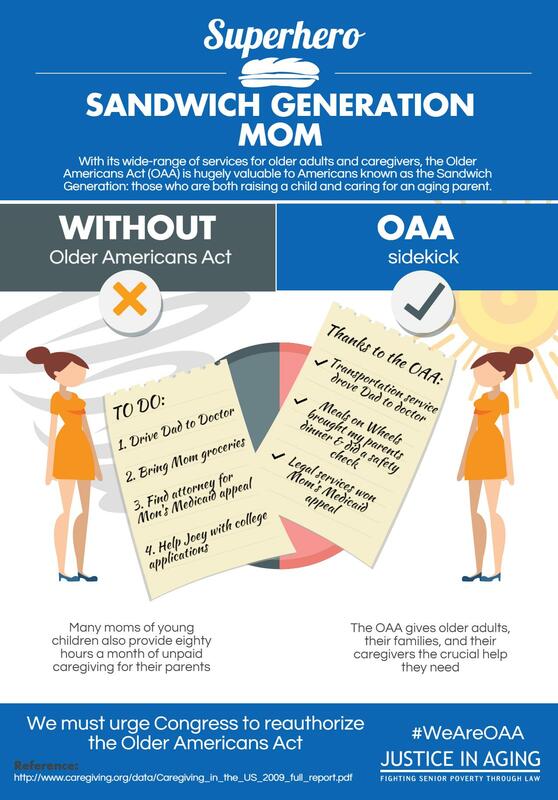 We have a long way to go to adequately support older Americans and the caregiving Sandwich Generation, but thanks the OAA, we have an infrastructure of support and services. Older adults who live alone and would otherwise be homebound, can access their doctors’ offices, pharmacies, and meal sites through transportation services. 3 million older adults received the meals they needed to stay healthy and decrease their risk of disability. 2,263 of legal services attorneys across the country received critical high-quality training and technical assistance just in the last year, to provide valuable assistance to older adults and their caregivers. Every day, the OAA provides this and so much more: caregiver respite, disease prevention, job training and community service programs, and elder abuse protection and prevention through the Long-Term Care Ombudsman program. Together, these OAA programs are the cornerstone of our nation’s community-based long term services, providing care for older adults and some respite for the caregiving Sandwich Generation. The momentum in Congress is building to reauthorize the OAA and invest in its programs. Throughout this month of celebrations, let’s take a moment to urge Congress to Get into the Act and provide the OAA with the reauthorization and support it deserves.